Student leaders ask questions and provide feedback during a Campus Culture and Climate working group update. Student leaders from the Associated Students of Washington State University, the systemwide Student Government Council and the Graduate and Professional Student Association are encouraged by the progress being made by the five Campus Culture and Climate working groups. Chairs from each group shared during a recent meeting the progress made in identifying and recommending solutions for creating a more inclusive and welcoming community at WSU campuses systemwide. Co-chairs and other administrators were also present to listen to student feedback and answer questions. Hannah Martian, Associated Students of Washington State University (ASWSU) Senator and editor-in-chief of the Chinook Yearbook, said many students are aware of the committees but not what they are accomplishing. She appreciated the opportunity to learn more. The Campus Culture and Climate working groups have been meeting since the spring with charges of reviewing and addressing needs as related to Executive Policy 15; cultural competency; campus cultural and resource centers; diverse faculty and staff and gender inclusive and trans* support. The Washington State University building code has been updated to ensure gender-neutral restrooms are included in new buildings constructed across the system. An assessment of existing cultural competency training being offered across the system is nearly complete and has identified eight different departments offering different levels of training. 40 resource centers have been identified across the WSU system. This data is now being reviewed to identify gaps in resource areas and underserved student groups. The revitalization of faculty and staff affinity groups is in progress which provides a sense of community and connection for underrepresented groups. 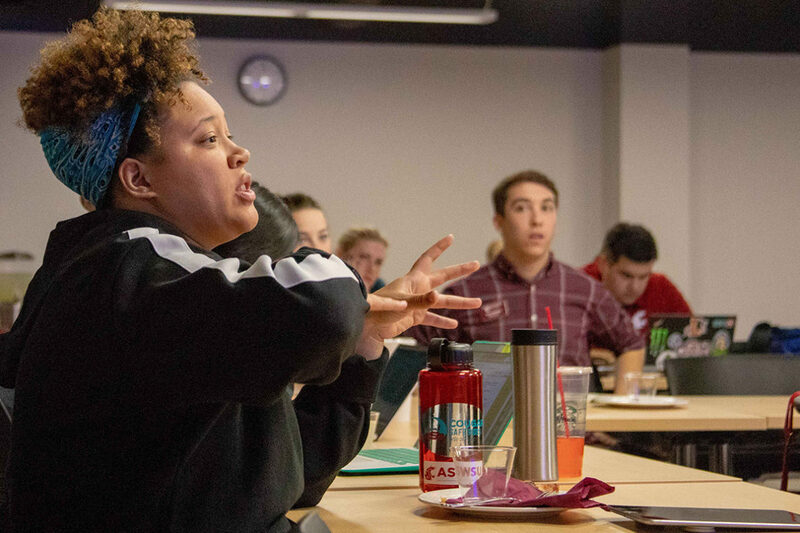 The development of resources and guidelines for students to better understand free speech law and how it intersects with WSU campus policy and climate. 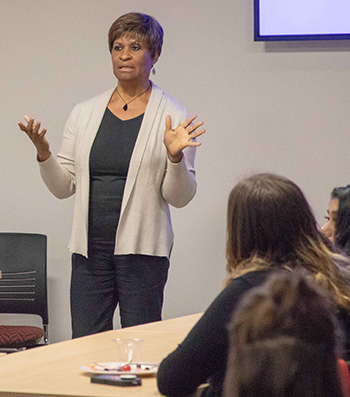 Donna Arnold, associate director for Multicultural Student Services and co‑chair of the Cultural and Resource Centers working group provides students with an update of the progress being made as part of the Campus Culture and Climate initiative. One thing Zachary Harper, ASWSU Tri‑Cities president, appreciated about the presentations is learning that the committees are working on behalf of students at all WSU locations. Nolan reiterates that the WSU community can continue to expect frequent updates as the working groups continue to make progress on their initiatives and recommendations. Students who are interested in serving on one of the groups are encouraged to submit their information along with the name of the group in which they feel they can bring valuable insight. For students not serving on the working groups, the presenters emphasized the importance of keeping them part of the process and encouraging them to provide feedback. Student leaders play a crucial role in facilitating this process. “I plan to share what I learned at our senate meetings, with my constituents, and even with my friends,” Martian said. Karen Ngigi, ASWSU senator and president of the African Diaspora Association, was also inspired to spread the news and wants to work with organizers to bring more registered student organizations into the conversation. Students systemwide who are interested in serving on one of the working groups are invited to check out the Campus Culture and Climate website. All told, the groups are comprised of more than 110 students, staff, and faculty from across all six campuses. Those interested in learning more about the progress to date can visit the working group website where overviews, meeting minutes and links to resources are published.